What is the best evidence for the soul? What is the state of philosophical debate over the existence of the soul? Can evolution explain the soul? In this episode, Sean McDowell and Scott Rae discuss these questions, and many more, with Talbot professor J.P. Moreland, one of the top 50 living philosophers today. 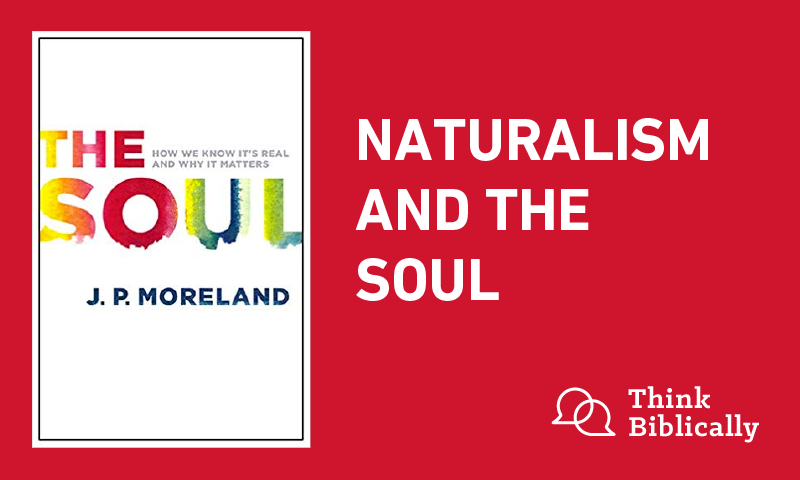 If you're interested in this topic, check out The Soul: How We Know It's Real and Why It Matters by J.P. Moreland. Dr. J.P. Moreland is Distinguished Professor of Philosophy at Talbot. He has authored more than 30 books and 70 articles in the area of philosophy and apologetics. Scott Rae: You're listening to the podcast, “Think Biblically: Conversations on Faith and Culture.” I'm your host, Scott Rae, professor of Christian ethics, here at Talbot School of Theology at Biola University. Sean McDowell: And I'm your co-host, Sean McDowell, an author, speaker and apologetics professor, also at Talbot School of Theology. Thank you so much for joining us. Scott Rae: We're here with my longtime colleague and dear friend, Dr. J.P. Moreland, recognized in the last couple of years as one of the 50 greatest living philosophers today, so quite an honor, and well-deserved with a litany of publications and speaking opportunities that would take us probably the length of the whole podcast just to list those. We're really glad to have you with us. He's an expert on basically all things apologetics and Christian philosophy. We have a number of questions, J.P, for you today. Most of which you've written recently has to do with the soul and the existence of the soul. You've written a lot about especially how the neural sciences today intersect with our teaching on the soul. Why is it so important that we talk about the soul today given what the neural sciences have basically assigned most of the functions that the Scripture describes as pertaining to the soul, they've assigned to the brain? What's so important about the soul today? J.P. Moreland: Well, it's really good to be with you both, and thanks for having me. I think the three reasons this is important. Number one — you've already mentioned it — the Bible's pretty clear that there's a soul, and if neural science has shown that there isn't one, well then the Bible's false. We're in trouble. One would hope that biblical teaching would win the day eventually, and I think it is. Secondly, if I'm just my brain and my body and nervous system, then I don't have free will, because my body is completely governed by the laws of nature. It's a physical object, and it does what it does according to natural law and whatever hits me. I'm like a complicated rock. I think third, if there's a soul, it makes understandable and reasonable that there may very well be life after death. Statistics have shown that as more and more people have become materialist about the human person, there has been a lowering of belief in life after death. I think it's important for that reason. So, those are three things that I think matter. Sean McDowell: How would you describe the state of philosophical debate today over the existence of the soul? Is naturalism still reigning, or do you see some progress being made? J.P. Moreland: That's a good question, Sean. I do see progress being made. For decades, the worldview of scientific naturalism, which we can clarify a little bit later, but it's basically that the physical world is all there is, was the dominant worldview because there wasn't anybody to oppose it. It's become increasingly obvious, for example, that consciousness just isn't physical. More and more naturalists have had to kind of fudge their views and say, "Well, everything's physical but consciousness." It's even becoming more reasonable to believe in a soul. I just finished co-editing a book that will be coming out with one of the leading academic presses of the world, Blackwell. It's going to be called The Blackwell Companion to Substance Dualism. We have 19 of the top materialists debating 19 of the top immaterialists, dualists, on 19 topics. This is going to show that dualists aren't afraid to engage, and that belief in the soul and consciousness is a live option today. If that's true, naturalism is false, because it can't explain where the soul and consciousness came from, if you start with matter. Sean McDowell: That's exciting to see. Thanks for your contribution in this area. Scott Rae: Let me go back to a statement you made just a minute ago about naturalism and how it has difficulty accounting for free will. That would seem to be a pretty substantial problem, that if we are just physical biological organisms, then there's no space for free will. How do the naturalists, the folks who believe that what you can see and feel and touch and ascertain with your senses is all there is, how do they avoid becoming these strict terminists about our free will? J.P. Moreland: That's a great question, Scott. There are really two strategies. One is that they become what is called compatibalists, which means they change what it means to be free. You're free if you can do what you want, but your wants are determined. It's really not freedom at all. What they do is they make freedom consistent with you being completely determined by your genetics and your brain chemistry and your input. The other way to go is what Daniel Dennett did. He said, "Look, there is no such thing as moral responsibility. There is no such thing as freedom. That's completely gone given materialism.” Why do we hold child molesters responsible, but we don't hold alcoholics when both of them are equally determined they're not responsible for what they did?" He said the answer is that it's socially useful if we punish child molesters, and it's not socially useful if we punish alcoholics. We punish one just because it's pragmatically helpful, but nobody at the end of the day, he says, really, if we're going to be honest, is responsible for anything they do. Scott Rae: If you press the question to him, what exactly makes it socially useful or helpful to punish child molesters if there's actually no philosophical basis for anything like moral responsibility? J.P. Moreland: He would have absolutely no answer to that because he would have no basis for any kind of objective evaluation of anything. Plus, to be honest, if he's right, he holds his view about this because he was determined to hold it. He didn't choose the view that he holds because it's rational. He was determined by his genes and his brain chemistry to hold this position. That's kind of a bad place to be. Scott Rae: Just so our listeners will know it, explain a little bit about who Daniel Dennett is and why he matters. J.P. Moreland: Yeah. Daniel Dennett is one of the leading four new atheists. He's a very well known and highly regarded philosopher that teaches at Tufts University. He is an absolutely angry, vicious critic of Christianity, and he has defended a Darwinist, materialist worldview his entire career. He's made an influence on a lot of people, and he needs to be answered. Sean McDowell: J.P, if you were going to give, say, one or maybe two arguments that you find the most compelling, philosophically speaking, for the soul, what would they be? J.P. Moreland: The first one is that my brain and my body are divisible, and they can become as a percentage. You can have 60 percent of a brain or 60 percent of a body if you cut off 40 percent. My brain and body are divisible, but I'm not. I can't be 60 percent of a person. I'm an all or nothing sort of thing. I'm either there or I'm not there, but if I'm there, I'm a 100 percent person. I can lose functioning, but I can't lose personhood. There's something true of me, I can't come in a percentage and be divided that is not true of my body and brain so I can't be my body and brain. I've got to be something else, and that's a soul. I think the second thing I've already mentioned is this whole problem of free will, so we won't go over that again. But if we are responsible, and we all know we are (my wife reminds me that I'm responsible for my behavior on a regular basis), that's true only if there's more to me than my brain and my body. I think the third thing is that there is something that is at least possibly true of me that isn't even possibly true of my brain and body. That's disembodied life after death. Even people who don't believe in life after death, when they hear about near-death experiences, will acknowledge that “I don't think these are true, but I'll admit they could have been. They could be true. They might be.” So they're willing to listen to a program to see what the evidence is. But they'd never listen to a program that said, “We have found square circles in Montana,” because that's not even possibly true. At least I'm the kind of thing that might survive the death of my brain and my body. But I'll tell you one thing about my brain and body: they can't even possibly survive in a disembodied state. There's something true of me that's not true of them, and I can't be them. I must be an immaterial something. Sean McDowell: We don't even have to look at the evidence yet for near-death experiences, although there's some compelling evidence for them; just the possibility in itself is an argument that the soul is distinct from the body. J.P. Moreland: Yes, and we have to distinguish that from an argument that there's such a thing as life after death. You use this argument to show that there's a soul, if I could possibly exist outside my body, but that's not enough to show that there really is life after death. Remember my argument was about the soul. Now I do think, as you pointed out, the resurrection of Jesus and the widespread evidence for near-death experiences puts beyond reasonable doubt that there is life after death. As you mentioned, that's a different argument. Yes, we just established the possibility, and that's all we need. Sean McDowell: You mentioned free will a few times. I find that compelling as well, but what if somebody just says, "Yeah, we don't have free will?" Do you make an argument for it? Do you just appeal to their common sense? Where would you go from there? That is not an example of where the person whose hand hit him was responsible. The scientist was responsible. We all know that. Why? Because the person didn't choose to do that. If a person is going to say, “I don't believe in free will,” then he can't hold me responsible for believing in it because I didn't freely choose it. The guy knows better than that. I think it's common sense that everybody knows that they've acted responsibly in their lives. I would appeal to that common sense intuition too. Scott Rae: I think I'd probably add a little bit to that. What would it be like if we lived in a world where there was no such thing as criminal justice or a moral responsibility for things? It seems to me if the naturalists are right, we're at the Lord of the Flies. J.P. Moreland: You are absolutely right. It's complete might makes right. It's chaos. By the way, you notice that that's where the political process has moved. There is now a search for gaining power over others rather than the right to rule. That's because people, many, have given up on free will. It would be utter chaos, Scott, and nobody would be responsible for anything. Scott Rae: Now you've written before that this is not actually a new idea, that if there is no God, then moral responsibility is in really big trouble. Nietzsche had a lot to say about that about 200–300 years ago. Scott Rae: Spell that out a little bit for our listeners. J.P. Moreland: You have to ask the question. If there isn't objective law that's true and that it imposes duties and obligations on us, where in the world could that come from? It can't come from a cloud of electron gas. If you start with a big bang and don't ask where that came from, and the history of the world is the rearrangement of matter into larger and larger more complicated chunks of matter, then at the end of the day, you're going to end up with rearranged matter. You're not going to end up with what ought to be the case. You're going to only end up with what is the case. The only way there can be a moral law is if there is an objective, good law-giver who has a will to impose a duty on us. That's the rough and ready argument. Scott Rae: What would you say to people like the sociobiologist E. O. Wilson and others who argue that morality doesn't come from any transcendent god? It's built into our genes. We get our moral standards just as a part of our evolutionary adaptation, and it provides an advantage to individuals and communities in passing on their genes. J.P. Moreland: He doesn't know that. He's a scientist. He's dealing with a field in which he's not trained: ethics. The other problem is he's committed what's called the genetic fallacy, that's faulting something for where it came from or verifying it for where it came from. Chemistry came from boiling toads in urine, but that doesn't mean chemistry is false. That's the genetic fallacy. Scott Rae: Don't sugarcoat that description, okay? J.P. Moreland: Yeah, okay. [crosstalk 00:13:55]. J.P. Moreland: If morality came from evolution, that doesn't have anything to do with whether it's valid. That's a separate question. The truth of the matter is that if morality came from a survival instinct, then our instincts aren't true. They're just useful. At the end of the day, the only thing evolution can give us are useful behaviors and beliefs, not true ones. Scott Rae: Let me take that one step further and apply that to rationality. How do you account for our rationality being reliable on an evolutionary scheme of things? If rationality is nothing more than something that is socially useful, shouldn't we be sort of skeptical about particularly our higher level rationality, which may have nothing to do with our adaptability? J.P. Moreland: This is spot on. C.S. Lewis long ago raised this. In recent years, Alvin Plantinga has raised it. What's interesting is one of the best known atheists in the world, Thomas Nagel, has actually raised the same point. He wrote a book called The Last Word and said, "How could there be such a thing as rationality?" He said postmodernism kills rationality because everything is relative. The Christian theist, he says, has a perfect answer to the question. There is a rational God, so in the beginning was the logos, not in the beginning were particles. That logos, or rational being, created us with the same kind of rationality to understand the world he made. He said, "I don't like that answer. I'm not arguing against it. I just don't want there to be a God because I don't want to be told what to do." He said it's called the cosmic authority problem, and he's honest about it. He said the evolutionary answer is the cure that killed the patient because evolution formed our body parts and our behaviors and our tendencies to believe, in light of four things: reproducing, getting away from danger, feeding and fighting. You don't have to have true beliefs to do that, especially true beliefs about abstract concepts like goodness, immorality, and “Do I have a soul?” and things like that. If a person consistently saw predators that were big as little, and food that he wanted to eat as little, even though it was big, and as long as he ran away from the right thing consistently, he'd survive whether or not he saw the object accurately. So you're right. Sean McDowell: For there to be objective moral laws, values and duties, it seems to me there has to be free will, as you talked about. There has to be a moral law giver outside of human race. J.P. Moreland: There does, yes. Sean McDowell: Third, there has to be a sense of human value and dignity. Can naturalism, in principle, account for this? Are you seeing any movements to give a naturalist explanation for intrinsic value, or is it simply impossible? J.P. Moreland: It's impossible. One of the leading legal and moral scholars in the last 60 years, Joel Feinberg, taught at New York University and at the University of Arizona, said that without the image of God, and this is in his book Philosophy of Law, without the image of God, the idea that we have equal rights is just indefensible, because he said, in order for us to have equal rights, we have to have two things in common. Number one, we have to have something in common that's equal. Number two, whatever that is can't be something trivial and silly. It's got to have gravitas and weightiness. It's got to have preciousness. But he says those kind of concepts are very much at home in a theistic view of the world, but it makes a naturalist very uncomfortable and a little queasy when he starts thinking that beings are precious. What is that about? You can't ground equal human rights based on a naturalist view because we're not equal in any way, except the image of God. That has to go by the window. The other thing, some people try to say, "Well, when matter reaches a certain level of complexity, intrinsic human value just emerged." My response to that is that's like pulling a rabbit out of a hat without a magician. That's just magic. Saying that something emerged is a name for the problem. It's not a solution. I want to know how can you get something from nothing? How can you start with matter, rearrange it, and get something totally different, namely the property of intrinsic value from brute matter that didn't have that property to begin with? Sean McDowell: J.P, let me shift gears a little bit here. You are just as passionate, just as articulate, just as driven as when I remember hearing you as an undergrad probably mid ’90s. What keeps you going? J.P. Moreland: There's no other game in town. Following Jesus is the best path, the most reasonable, and the most likely to be true approach to life that there is. If you can show me a better way to approach life, I'll adopt it. I'm kind of suspicious by now. I'm almost 70, and I've pretty much looked at what's out there. Scott Rae: You are really old, you know it? Good night. J.P. Moreland: I am, thank you. I'm feeling an awful lot of love right now in this room. Yeah. I don't know that I've got any other hope than to cling to Jesus and give him whatever I've got. I want to finish well and die well. That's kind of honestly my goals now. That's why. People say, "How do you keep from getting proud?" The answer is, number one, I have to live with myself. That's a problem. Number two, have you ever seen the dude we're serving? He's just a little smarter than the rest of us. I think he's a little bit morally better than I am, a little bit. It's kind of hard to get too big-headed when you look at Jesus. I think that's a problem. Scott Rae: You've had a great legacy, not only in Christian philosophy, but also in popular apologetics. You've spoken all over the world to hundreds of thousands of people on popular apologetics. It's really common today, I think, to hear people say, "Nobody has ever argued into the kingdom of God. They're loved into it." How do you respond to that statement? Then how do you see the role of apologetics in our culture today? J.P. Moreland: Boy, you guys are asking such good questions. Can people be persuaded and argued into the kingdom of God? The answer is absolutely yes. I've done it many, many times. In fact, in Acts 17:4, Paul provides evidence for Christianity. You know what it says in 17:4? It doesn't say, "And some of them were converted." It says, "Some of them were persuaded." What that means is they understood the argument and, doggone it, they bought it. They became Christians because they were convinced and persuaded that the argument was a good one. Now look, I'm never going to go evangelizing and giving arguments for the faith without asking the Holy Spirit to work with me. I may be dumb, but I'm not stupid. I would certainly never go it alone, but can you persuade people? I've done it hundreds of times, and the New Testament says that you can do it. I personally believe sometimes that that response, "We need to love them into the kingdom," is an expression to cover laziness and an unwillingness to really study and try to do your homework. Not everybody. Scott Rae: It certainly can be. J.P. Moreland: It can be. Yeah, you can persuade people. Paul did it himself. Scott Rae: I think sometimes what people mean by that when it's not a front for laziness is that our evangelism and our apologetic needs to have a relational component to it too, which I know you would agree with. J.P. Moreland: I completely agree with that. Completely agree with that. Scott Rae: I think maybe your best contribution was your book Love Your God with All Your Mind. I've told you that before that of all the things you've written, that might actually be the best thing you've done to serve the kingdom. J.P. Moreland: I appreciate that. Scott Rae: Why is loving God with your mind so critical? What does that involve? J.P. Moreland: Dallas Willard said, "Don't you think following Jesus would require us to be thoughtful?" He didn't mean courteous. We're following the smartest man who ever lived. Don't you think we should be thoughtful about life? Jesus actually commanded us to love God with our minds in the great love commandments so it would be disobedient not to. I think, finally, I want to see all of life from my discipleship. I can only do that if I try to think as carefully as I can. Scott Rae: Why do you think that so many people fail to do that? J.P. Moreland: I think that, this is a long story, but in the first two decades of the 20th century, there was a shift about religion from it being a matter of the mind and the heart to it being solely a matter of feeling and the heart. I think that that began to carry on, and so fewer and fewer Christians cared about the mind. In fact, in some denominations, as a result of this shift, pastors didn't have to know anything and be trained to be pastors. They just had to feel a call to be a pastor. Think about this. To teach 7th grade English literature, you had to know something. To be a pastor of a church, you didn't have to know anything. You just had to have good intention. Scott Rae: You had to feel something. J.P. Moreland: You had to feel something and feel called. It's a both-and, of course, but I think that's what happened. Scott Rae: What are some of the things that churches could do to promote the life of the mind for the men and women and kids that they serve? J.P. Moreland: First thing they have to do is they start needing to put posters all over the church that don't use the word faith, but use the word “knowledge” or “reason.” "Come let us reason together.” “Always be ready to give an answer for the question.” “We can know God from the things that were made." Start putting posters that celebrate the cognitive aspects of Christianity instead of simply the faith aspect, which is a both-and. That's the first thing because that will create values, I think. Secondly, I think there need to be some sermons that actually don't apply to your personal life, but apply to cultural issues that we're facing, and try to help people learn how to think about these important cultural issues. I think the third thing would be to have Sunday school classes that deal with certain topics and invite people to come and learn how to think about what's going on in our culture. Scott Rae: Yeah, I wonder if we also need to make it clear to the men and women we serve in our churches that when they come to faith, they're not only committing themselves to a person, but also to a set of ideas, a set of lenses through which they view the world. J.P. Moreland: You know, Scott, I'm so tired of hearing that Christianity is a relationship with a person. That's true, but it's a lot more than that. It's a system of thought, and it does involve the world of ideas. It's a both-and again, not an either-or. Scott Rae: Great. We've been just delighted to have you with us, J. Thank you for taking your time to be with us and for, as always, your insightful comments about the intersection of Christian knowledge and apologetics and philosophy. You notice I didn't say Christian faith. Scott Rae: I said Christian knowledge, culture and philosophy. J.P. Moreland: You are the man. Scott Rae: I can be taught. J.P. Moreland: You can. Scott and Sean, it's been such a joy being with you brothers. Love you to death. Thank you for the privilege. Sean McDowell: This has been an episode of the podcast “Think Biblically: Conversations on Faith and Culture.” To learn more about us and today's guest, Dr. J.P. Moreland, and to find more episodes, go to www.biola.edu/thinkbiblically. That's biola.edu/thinkbiblically. If you enjoyed today's conversation, give us a rating on your podcast app and share it with a friend. Thank you for listening, and remember, think biblically about everything.